But what begins as a dare becomes an intense attraction neither Ryan nor Beth expected. Suddenly, the boy with the flawless image risks his dreams-and his life-for the girl he loves, and the girl who won’t let anyone get too close is daring herself to want it. 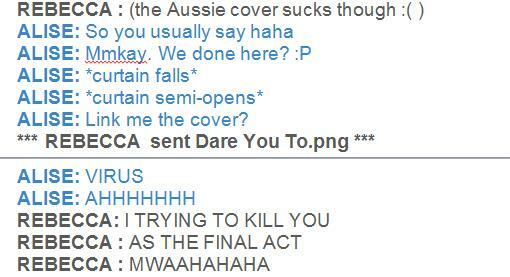 So Bec and I are trying a totally new thing where we actually discuss the book on Skype because we are lazy creative. You can go ahead and be jealous. But because Bec loves to give out her personal information over the internet, I had to go and remove her last name. 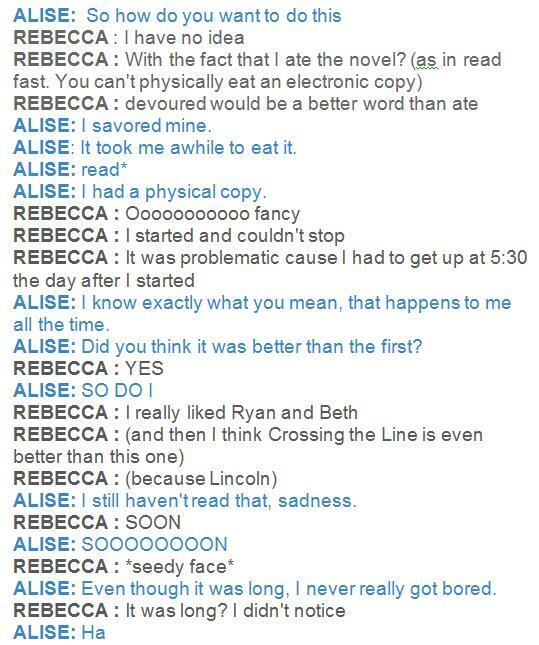 Basically, I couldn’t screencap the skype chat so I just did this. Don’t be afraid to tell us what you think but be nice because as you can see at the end, Bec is a violent person. After the initial awkwardness, you can really see our weird, juvenile personalities shine through. So here is our crazy all-over-the-place for Katie McGarry’s new piece of awesome: DARE YOU TO. Sad to say we are actually legal adults. Hope you found this entertaining, and don’t forget to get your hands on DARE YOU TO as soon as it comes out on May 28th! LOL I loved this chat! I’m about 75% through it and I love it so much! I also like it better than Pushing the Limits. I love Ryan and Beth a whole lot. Can’t wait to finish it today! Thanks! 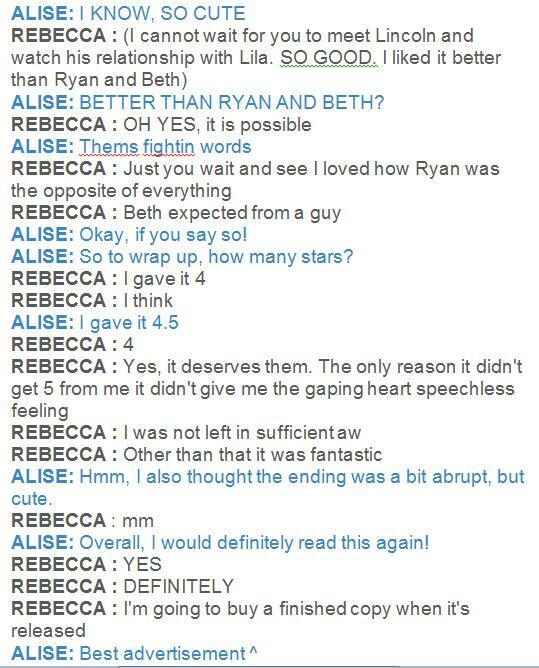 I love Ryan and Beth too! Can’t wait to read your review. I think it is because it is a name we don’t see much of anymore. Glad to hear that because I really do like this one better! :) I was really upset about that fact at first too, but you’ll see-it all works out great! Great chat. I don’t know if I thought it was better, because the characters and themes are a little different, but I know I loved it. Oh, for sure. They tell two really different stories with really different characters. If I were to rate it on enjoyment, though, I liked this one better. LOL! I love this idea! I absolutely loved this book! This was my first Katie McGarry book and I ran out and bought Pushing the Limits and read it as soon as I finished this one. 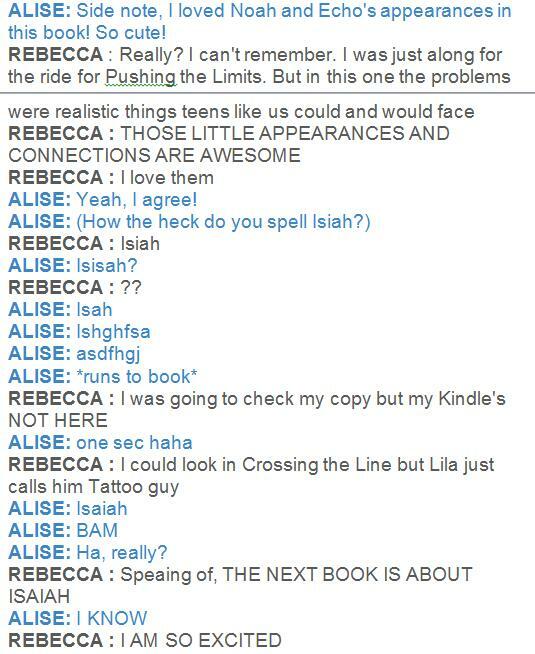 I think I liked Pushing the Limits a little better but only because I absolutely loved Noah. I really liked the Good guy goes for the bad girl change up for once. Thanks! That is interesting, maybe it depends on the person and which book they read first. That makes me curious as to if I would have liked Pushing the Limits better if I had read it after this one. Really? 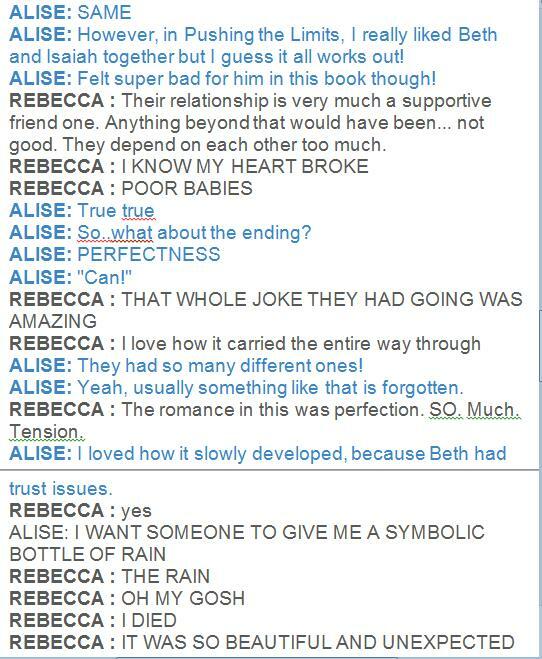 That just made me wonder how a relationship between Beth and Noah would work…intriguing. The rain was so cute! Thanks for your comment! I loved the chat review. It basically covered everything I thought of the book. I’ll have to read Crossing the Line now. Thanks, we were a little worried it might be too vague, so that is great! 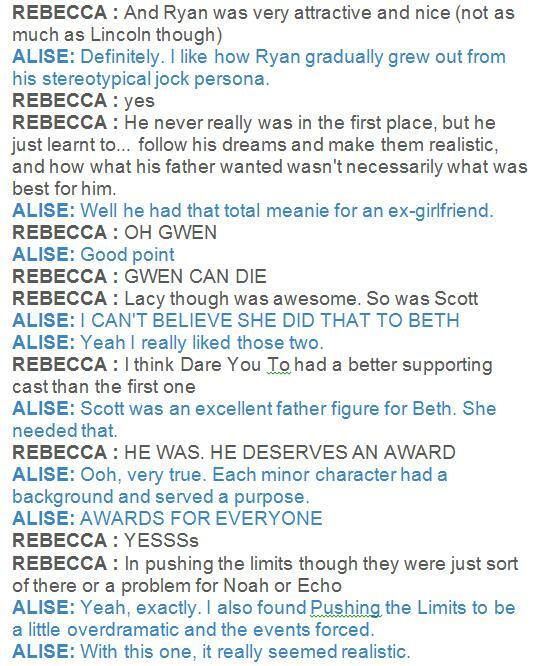 I so agree with Rebecca: Dare you To have such a great supporting cast, I loved Beth’s best friend ( I can’t remember her name, Chris gf) and Yeah, Gwen can DIE. And I loved the Can game they played throughout the book, it was too cute. DYT was so much better than PTL and I’m definitely going to buy a physical copy when it’s out. Lacy! Loved her too, she was such a good friend for Beth-she really needed someone on her side that she had trusted in her past. Thanks! Ha! Yay! Glad you thought so :) You should definitely check out McGarry’s books! LOL. Well we posted so it’s our own fault! Happy you liked it, we will definitely do it again! Thanks! I also loved Lacy, she was exactly what Beth needed!